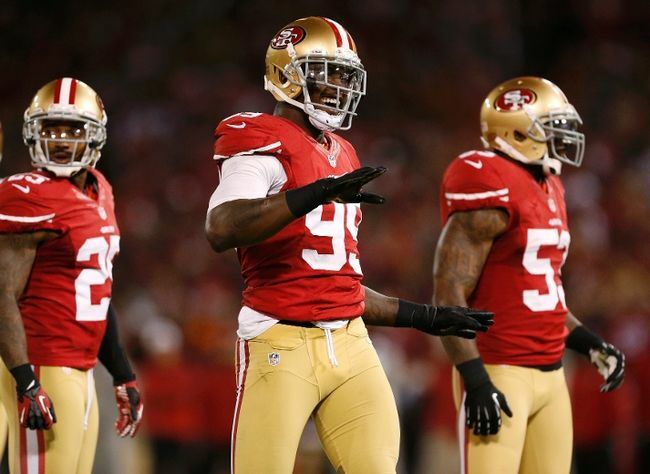 Aldon Smith the talented linebacker for the San Francisco 49ers spoke on Tuesday in public for just the first time since entering a rehabilitation program for alcohol abuse on September 23. His return to the team has affected the NFL lines at Topbet.eu Sportsbook, as he will make the 49ers defense stronger than it previously was in his absence. Smith told reporters he had completed the program on October 28 at a treatment center outside California. The team activated him last Thursday to their 53-man roster. He started practicing this week. Smith said he now was taking everything just a day at a time. However, he has thought about playing this Sunday in the team’s home game versus the Carolina Panthers. Smith could possibly be brought back on a slower basis by the team. Smith leads the NFL in quarterback sacks since 2011 with 38 and had 4.5 in the three games he played prior to entering rehab. Since he left the team, the 49ers have won five straight games. San Francisco is only one game behind the Seattle Seahawks in second place in the NFC West. Smith went into rehab voluntarily after being arrested a second time for drunk driving. Smith told reporters he was thankful that some many people have supported him during his difficult personal problems. He has started to settle back into a daily routine between his practices while caring for his son who is just 10 months old. Several teammates from the 49ers expressed their pleasure that Smith was back. Others said they had maintained some contact with him while he was at rehab. Smith still faces legal issues. As well as the drunken driving case, Smith also has felony gun charges against him that are from a party he hosted in 2012. On Tuesday, Smith said he had spoken to the league office, but not directly with Roger Goodell the NFL Commissioner. Goodell has said he will consider that Smith voluntarily entered a rehab when determining what if any league discipline is handed out. If Goodell does not suspend Smith, he could hand out a fine.